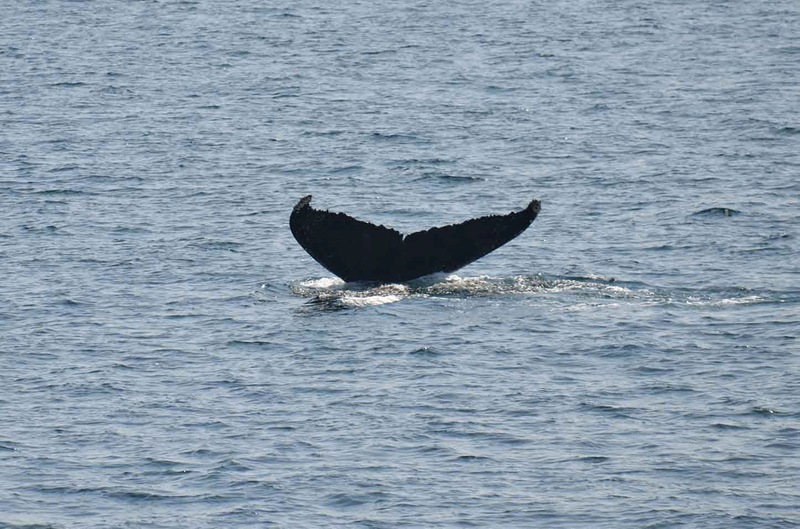 This morning on the 9am whale watch onboard the Cetacea it was a gorgeous to be out on the water. The past few days have seen very low humpback whale sightings so our captain decided to travel out to the northwest corner and then travel down the bank in search of whatever might be out there. The clear conditions made this a perfect plan and near mid bank we spotted our first whale. This turned out to be a humpback engaged in some bubble feeding – always a good sign! We identified this animal as Grackle from the smattering of white on his all black fluke. While watching Grackle we spotted another humpback doing some surface activity, breaching and tail lobbing, not far away and decided to go investigate. This turned out to be Shuffleboard who was also doing some bubble feeding. At one point Shuffleboard surprised us with a huge tail breach! Other than whales we spotted quite a lot of life on the bank including huge amounts of birds, mainly shearwaters, and a great sighting of a harbor seal. On the 1:30 trip we headed out towards mid-Bank in search of the whales from earlier in the day. We heard a report of a whale from another boat and went over to take a look. This whale had gone down for a dive and we were waiting for it to come up when we were surprised by a huge breach! For the next half hour straight we were treated the humpback, Shuffleboard, breaching and flipper slapping! It was an incredible and moving sight and an amazing opportunity for photographs. 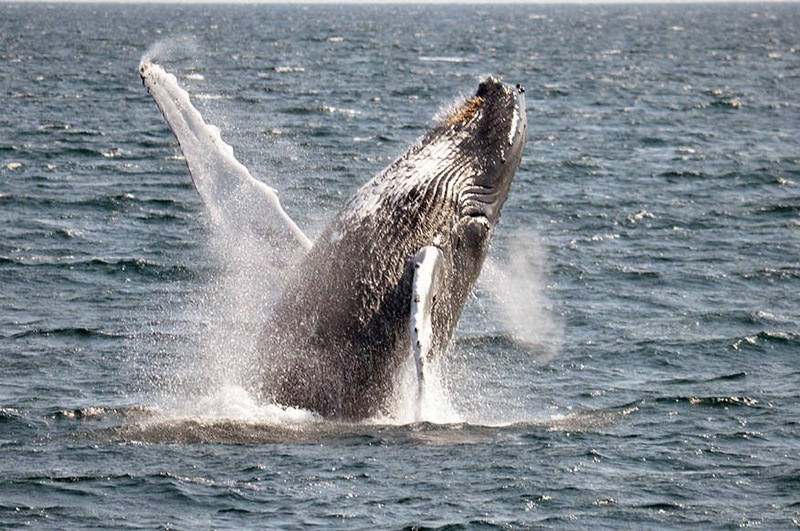 The reasons why whales breach are mysterious and while there are lots of theories including to communicate, to get rid of parasites, or maybe even just for fun, we really don’t know the reason and it is a hard behavior to predict, especially the repeated breaching we got to see today! Whatever reason Shuffleboard was breaching, it was amazing to be there to witness it. 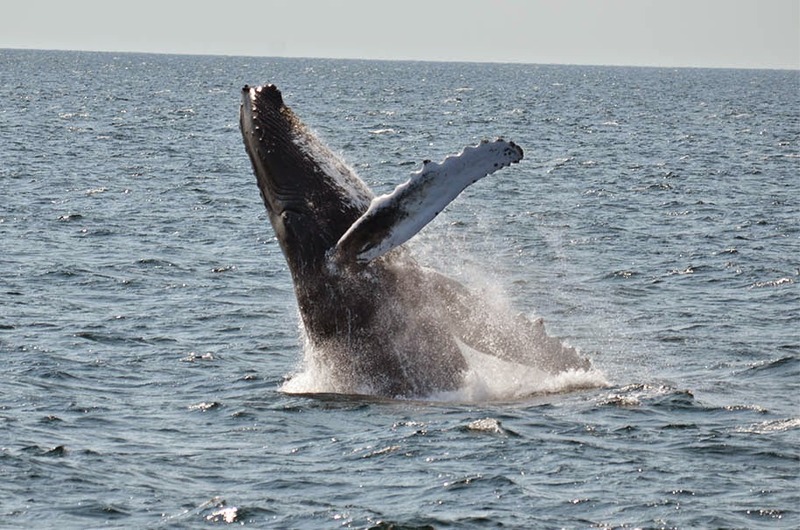 Today on board the Asteria we headed to the south where the Cetacea had sightings of at least two humpbacks. 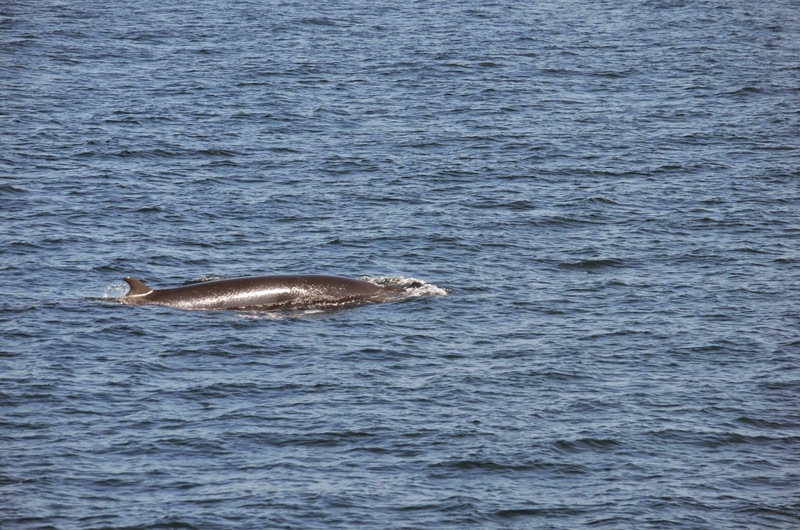 On our way, we encountered two minke whales who spent a few minutes up at the surface. The last minke whale was pretty shy but after we had passed it breached! 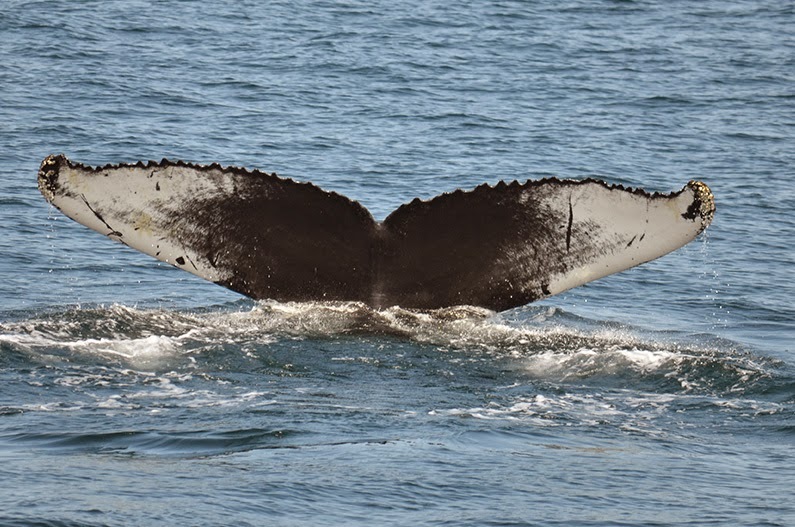 When we arrived in the area where the Cetacea was getting in their last looks we spent some time with a whale that turned out to be Shuffleboard. Shuffleboard was taking 5-7 minute dives and surfacing for only a few breaths but gave passengers a great look at his/her fluke. While we were waiting for Shuffleboard to surface another minke decided to make an appearance. This whale stayed with us for around 20 minutes, surfaced multiple times-while showing its rostrum-and even turned over underneath the right pulpit. I’ve never seen a minke whale get that close to the boat and stay that active-so much so that I could even use that moment to talk to passengers about countershading! This minke also spent a lot of time changing direction and surfacing in the middle of rafts of shearwaters. After the minke activity slowed, we travelled to where there were to humpback whales in the distance. By the time we make it over to the humpbacks they had separated but we were able to identify one of the pair as Grackle, a male born in 1997. Grackle was taking 5-10 minute dives and spending little time on the surface. We got a couple of good looks at him before having to head home! All in all a wonderful day-the minke whale activity was incredible! 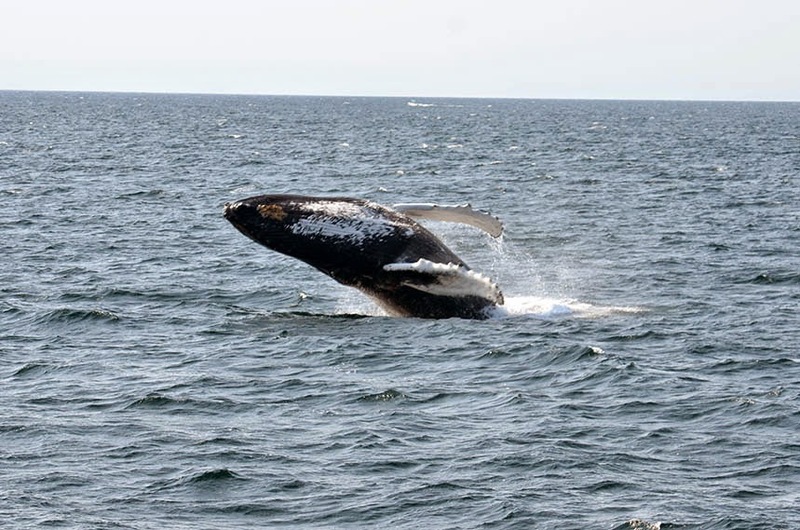 Today on board the Aurora for the 12pm whale watch we traveled out toward the middle of Stellwagen Bank. Luckily the 10am Whale watch found whales, so we traveled to the location that they shared with us. We found ourselves in the middle of the bank, in the shipping lane where we came across three scattered humpbacks! We spent the majority of our trip with a humpback named Mogul. He was taking 3-8 minute dives and showing us his tail on each dive. Toward the end of the trip Mogul started to pick up some speed and began to travel south. 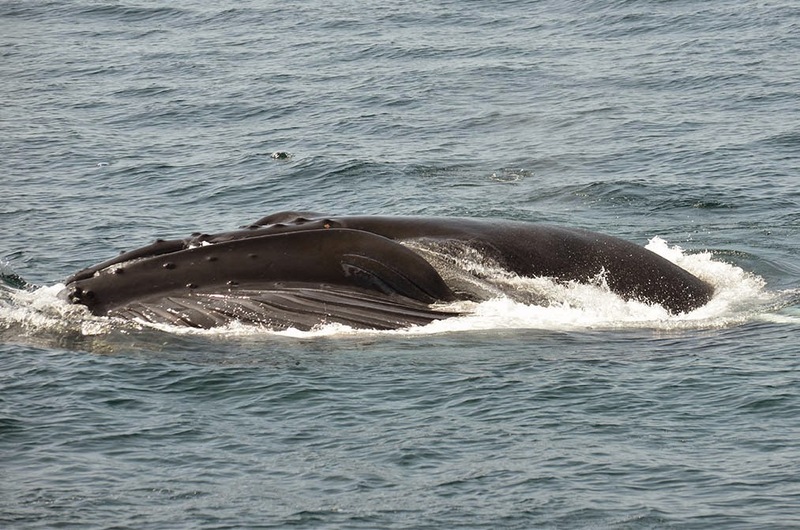 The two other whales in the area were a distance away and traveling further away, so we stuck with Mogul. 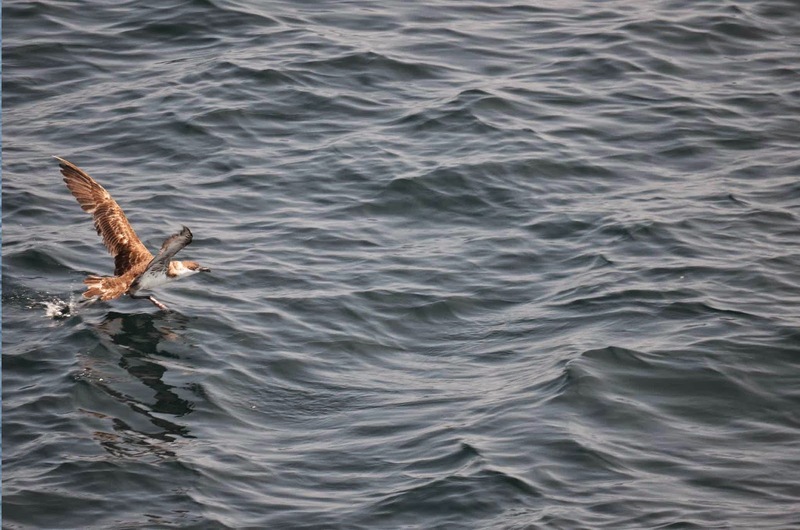 Although in the distance we saw one of the individuals take a dive and quickly snapped a photo of its fluke. It was Shuffleboard! 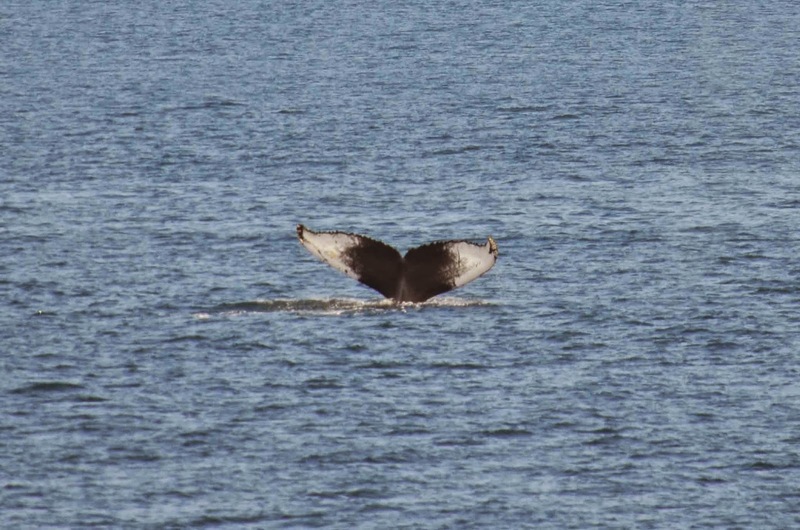 It is a great to know that we have some humpbacks back on the bank.